The latest waves of Star Wars figures seem to be shipping fairly well, particularly to Wal-marts up here in Michigan. 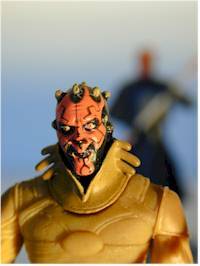 This is one of the very latest, the Sith Apprentice Darth Maul. Correct me if I'm wrong, but doesn't this figure make a first? This is a outfit not seen in the movie, on a character from a movie (and not a novel for example). I don't think we've ever seen that before - while we've seen some odd figures in the Shadow of the Empire line I don't believe we've ever seen a main character like this in a standard Star Wars line in a costume NOT seen in a movie. I'm sure you'll let me know if I'm wrong. Wal-mart has continued to price these at the lower price of $5.86, better than a buck cheaper than Target or Toys R Us. Look there first, and spend your money there if possible to reward them for following Hasbro's suggested retail. Been there, done that. It's better than some of their previous lines, but the Power of the Jedi packages are already getting stagnant. I'm torn on this one. I like this head sculpt, and I particularly like the suit sculpt, but the mouth...it's sculpted in what is intended to be an evil grin, but doesn't quite work for me. Instead he comes across as silly, and I would have preferred a straight look. The other problem with the sculpt is the tightness of the left hand. It makes it very tough to get the light saber to fit into the hand. Nice work on the paint ops here. Hasbro tends to be hit or miss, but the face paint is nice, and the suit color terrific. This figure is actually pretty well articulated for a Hasbro Star Wars specimen. Neck, shoulders, waist and hips are standard these days, but we also get one cut joint on the right arm. So why the low score? 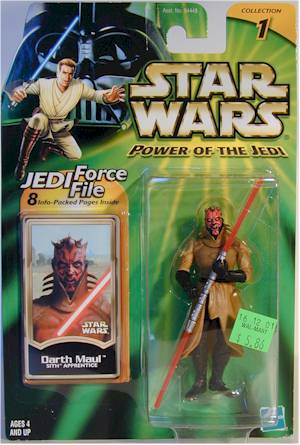 Because without the second cut joint on the left arm, it's almost impossible to have Maul hold this saber properly. It would have helped had they sculpted his hands better - see above - but even then, the angle of the left arm does not work well. Not a bad value at $6 or less. At $7 or more, it's starting to get tough to justify though, particularly since we still are getting these stupid little pieces of paper with the figures. Do they really think this adds value? I almost gave this figure three stars, but I was disappointed with the difficulty I had getting the light saber into his hands, and being able to do more than one pose. 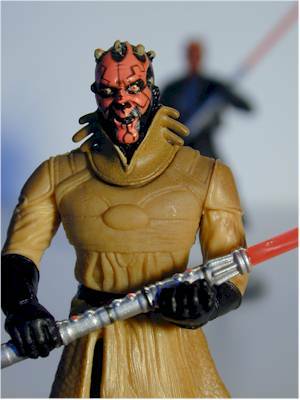 The grin doesn't help either, but it's still one of the better Maul versions in the 3/34" line.